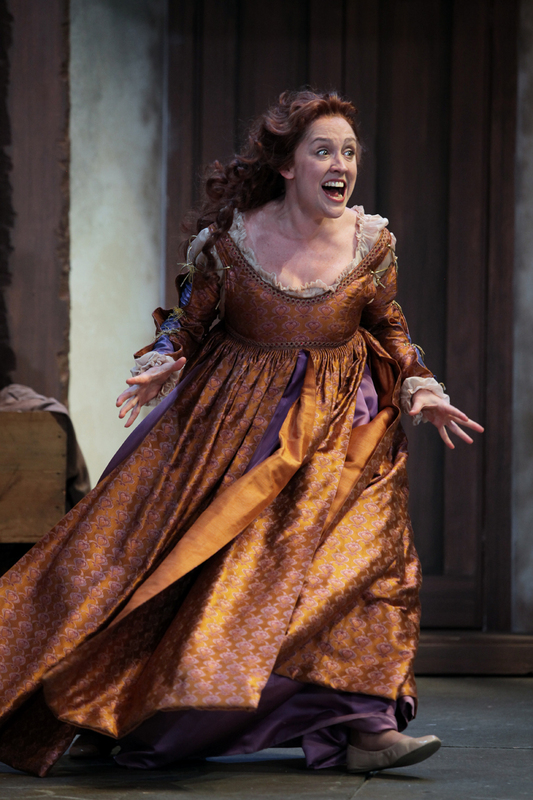 Kelly Mengelkoch as Kate in Cincinnati Shakespeare Company’s 2015 production of William Shakespeare’s “The Taming of the Shrew”, directed by Kevin Hammond, playing April 3-25, 2015. Performances are located at CSC’s Theatre, 719 Race Street in downtown Cincinnati. Tickets are $14-$35 and are available now online at cincyshakes.com or by calling the box office 513.381.2273. By Mikki Schaffner Photography. 1. The cast is superb. We all know how good folks like Nick Rose, Kelly Mengelkoch, Billy Chace, Jeremy Dubin, and other long time members of the company are. I don’t think I’ve really expressed how impressed I am by Jim Hopkins work, though, and I thought the entire ensemble was focused, funny, and on point. Mengelkoch remains perhaps my favorite actress in town; she’s certainly the most versatile. As “Kate,” she manages to be likable and terrifying all at the same time. It’s really something. 3. I think Caitlyn McWethy is underrated. I’ve enjoyed her every time I’ve seen her on stage; as a newer member of the Ensemble, she’s getting cast often and this is a great thing. She is “Bianca,” the sister of the Shrew, and keeps up pace for pace with the dynamite Mengelkoch – just like she did in LITTLE WOMEN with Maggie Lou Rader. She’s a star. 4. It’s nice to see the rarely performed induction to the show. Sure, it tacks on more time to the play, but it’s really nice to see that while the director has made some changes in the traditional tone of the show, he’s gone back to the original script and included this often omitted piece of the show. 5. You’ll get your money’s worth. If you were to break down the cost of a ticket by the minute, you’re more than getting your due. Yes, its long; 89 minutes for just the first act and 68 for Act Two, but Act One breezes by quickly thanks to the direction and hilarity. There are some really good recurring gags and again, the cast is sharp. You might want to be sure to use the restroom before the show, though. I recommend THE TAMING OF THE SHREW and strongly encourage you to get your tickets now. The show was sold out on opening night and as this is one of the Bard’s more popular titles, its likely finding a seat could be a challenge at some performances. Don’t hesitate and enjoy this very fine production. 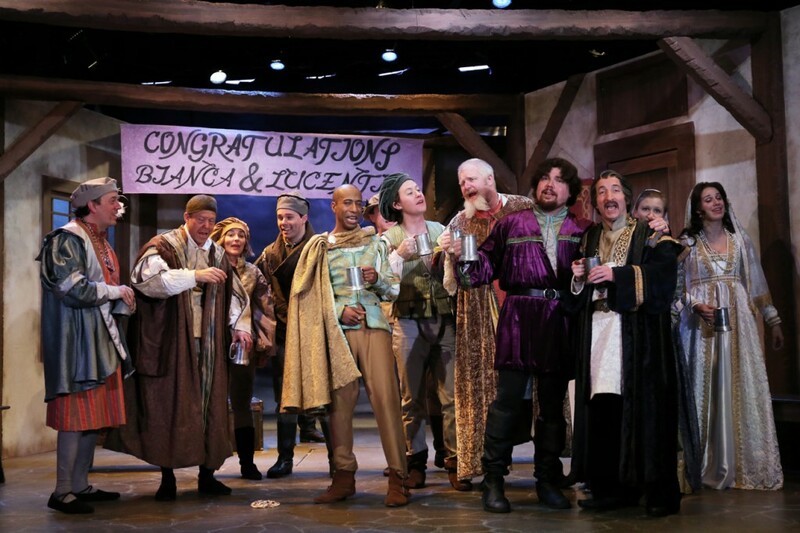 THE TAMING OF THE SHREW runs through April 25th at the Cincinnati Shakespeare Company on Race Street in Downtown Cincinnati. Click here for more information and to get tickets.